On Thursday, January 28, 2016, Senior Fellow, Institute for the Study of Diplomacy, Georgetown University, Mr. Casimir Yost gave us a special lecture on The Group of Seven(G7) and the Rise of the Rest at Regional Innovation Hall of Garaduate School of Regional Innovation Studies. 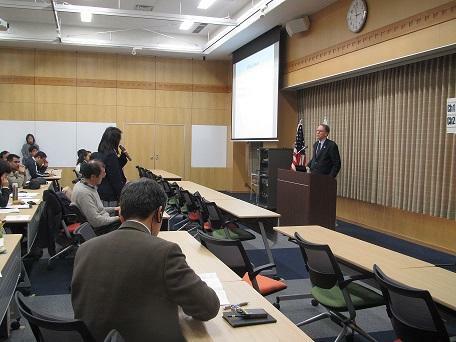 This lecture was held with cooperation of US Consulate Nagoya and provided simultaneous interpretation service. Mr. Casimir spoke about recent world situation, issue that each G7 country is currently facing and expectations for G7 ISE-SHIMA SUMMIT. After his lecture, we had a discussion session. 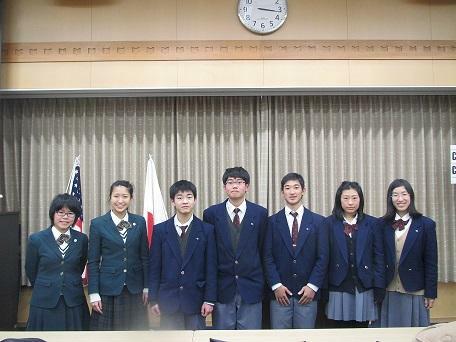 There are many questions from high school students, exchange students and professors. Mr. Casimir responded to question of "What is the importance of leader" as follows. "You need to receive a great education, have a sense of curiosity in everything, and visit to many places. Good leader has a strong sense of curiosity in everything and ask many questions. I only answer question, though." It made us all laugh. Participants were listening his wonderful speech with great interest and were able to deepen their knowledge more about world trends.